Could Grassley’s peeved tweets be a bad sign for the White House? WASHINGTON (CNN) - On Sunday, as President Obama was wrapping up a visit to France, the ranking Republican on the Senate Finance Committee - who will play a key role in the consideration of the health care legislation the administration has called a top priority - posted a few pointed comments on Twitter, aimed directly at the president. 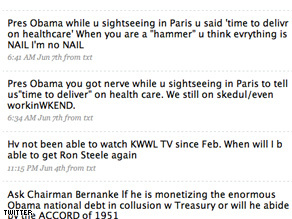 "Pres Obama you got nerve while u sightseeing in Paris to tell us 'time to deliver' on health care. We still on skedul/even workinWKEND," wrote Chuck Grassley of Iowa. Later, he added: "Pres Obama while u sightseeing in Paris u said 'time to delivr on healthcare' When you are a 'hammer' u think evrything is NAIL I'm no NAIL." The White House later said the president looked forward to working with Congress when he returned from D-Day commemoration celebrations in France. I think it's high time that we tell our elected officials, enough of dragging your butts and let's get some work done for a change. Part of the problem in Washington is it takes far too long to get things done. Obama promised during his campaign that he would change the way things are done in Washington and I'm personally glad to see that he's putting pressure on them. Make 'em earn their paychecks. Everyone is worried about private insurers. Well I'm not, it's sheer greed that caused healtcare to be so expensive now. An example of this is the nurses in Englewood, NJ not satisified with their salaries when quite a few of them made over $100K. It's sheer greed; same thing with over-paid workers at GM, it's no wonder they went into bankruptcy! Competition is the key to get prices down. GO OBAMA!! I think it's great too that he is including the American public and letting us see the mess that goes on in Washington. Some have criticized him for including us – but aren't we the people they're all working for? We have a right to know and make sure that they cast their votes the way the VOTER wants them to cast it and not based on their personal agenda! Really can't agree with Grassley, but was tempted, at first, not to be concerned with his "tweet," since there is a limitation of 140 characters. However, if he had taken the time to use accepted abbreviations, he could have gotten his point across. Just another outlet for the far-right to spread their unique brand of hatred. Senator Grassley. Seriously – go to an AA meeting. They can help you and it is anonymous. They cant fault him on the job he's doing as President so they hit him below the belt for attempting to be a good husband and family man while being President! Taking his wife to a Broadway Play, taking his family to a museum in Paris while he is attending to his duties as President representing the country on the Anniversary of D-Day, to Racistplicans is all inappropriate. Their attempt to compare his being a family man to the equivalent of being derelict in his duties as President is utterly ridiculous! This President has tackle more issues in his first 4 months than Bush ever did in 8 years! Com'on the man is entitled to a little R&R and to take in the perks of the job! To suggest this President is somehow sleeping on the job is purely bias and hypocritcal. To tie him to a higher standard than other Presidents is unfair. I never heard the Racistplicans complain about the weeks on end that Wacko Bush spent in Waco! I know that twitterers like to abbreviate things, but don't they know how to spell? Even for the party of the undereducated, this guy sounds like an idiot. Chuck thinks he's "hip" if he uses "lingo." Too bad the young generation fleshed all that poor spelling out in 1994. Plus, you can use 140 characters on Twitter. Use them! What a crybaby. And considering Bush's vacation time, what a hypocrite. Embarassing, simply embarassing to look at those comments. That's what our taxpayer's dollars are paying for? lol this is just too funny for me. Forget all the vacation time the predecessor took, is this GOP senator suggesting that he and his colleagues can't handle health care reform without the president looking over their shoulders? One would think that as the minority party, they would jump at the chance to do something good for the country without the president. But that would require them not not only have ideas, but be liable if those ideas were bad. For the record, where is the alternative solution to fixing health care? ya know, the magic solution that the conservatives are promoting that would keep government from having to step in to the mix in a major way. Time to face facts, if you can't solve the conservatives can't solve the problem without the Government, then ignoring the problem and trying to block government solutions is not going to give health care to the millions who have been laid off, the students who are entering the unemployment line straight from school, and the workers who work for companies who can't even afford to provide health care. Chuck Grassley has been delivering pork barrel to the farming interests all his political life. Suddeny he is working on health care on weekends? And, Chuck, it's not the first time a president has gone overseas. So chill and hope your precious farm subsidies and corn ethenol scam programs are not taken away to pay for things all Americans need - like health care insurance.